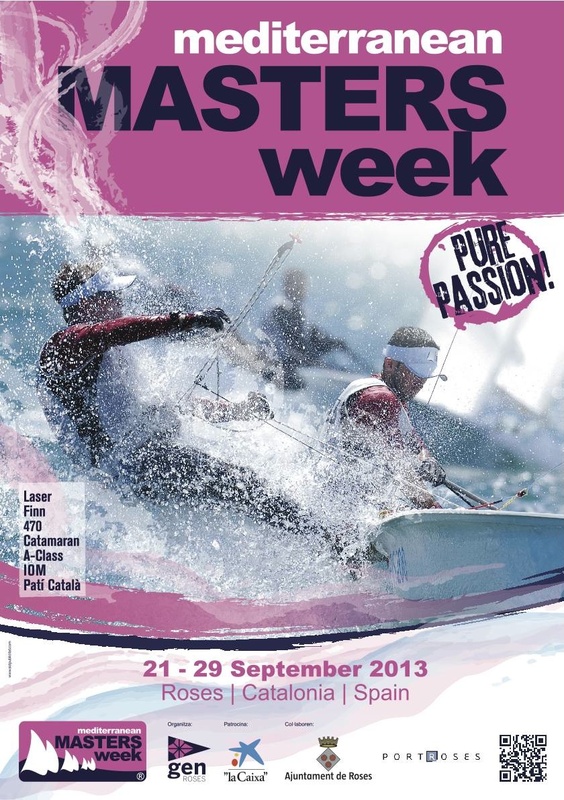 The inaugural edition of the Mediterranean Masters Week (MMW) is held in Roses, Spain, from 21 to 29 September. The Organising Authority for the regatta is the Grup d’Esports Nàutics de Roses (GEN) and the Real Federación Española de Vela (RFEV) in association with the Catalan Laser, Finn, 470, A Class, Patí Català de Vela and IOM Class Associations and the Catalan Sailing Federation (FCV). 1.1. Each regatta will be governed by the “rules” as defined in the Racing Rules of Sailing (RRS). 1.2. Add to rule RRS A11: ARB means scoring penalty after arbitration, PTS scoring penalty for a yellow flag after finish. 1.3. Sails shall have the full sail number AND NATIONAL LETTERS in accordance with the Class Rules and RRS. The national letters shall denote the National Authority of which the sailor is a member in accordance with RRS 75.2 and with 2.1 Entry regulations above. This changes RRS Appendix G 1.1. 2.1. Only current fully paid members of each class association and of an ISAF National Authority may enter the MMW. 2.2. Crew substitution of the registered sailor is not permitted. 2.4. Any sailor who has not, by the closing time for registration, completed registration at the venue will be removed from the list of sailors for that event and will not be scored at that event. This also applies to sailors who have complied with all other entry requirements. 3.1. Entries shall be made online through (alternatively, the “Official Entry Form” may be sent by fax at the GEN Roses office – fax Nr. +34 972 257 007 or mail to info@genroses.cat). 3.2. Entries shall be made before 15 September 2013. The Organizing Committee has the right to accept entries received after this date. 3.3. Entry fee is 45 €. Its payment must be carried out according to point 3.4 of this Notice of Race. For entries made after 00:00 hrs local time on 15 September 2013 an additional late entry fee of 15 € will be charged. 3.4. All Laser competitors in the MMW are automatically registered at TO BE Laser Master Trophy. Please mark your sail number and name as a reference of the transfer and keep the receipt with you to avoid any misunderstanding. 4.1 Each competitor shall personally register and sign the registration form at the Race Office from 09:00 am on 21st of September till 2 hours before of the 1st race of the class which will be competing. 4.2 During registration all participants will be required to show evidence of current membership of their national Association and the ISAF National Authority, and the minimum third part liability insurance cover of 700.000 € (seven hundred thousand Euros). 4.3 Spanish competitors will be required to show their 2013 National Sailing License card. Boat and equipment may be inspected at any time for compliance with the class rules, wet clothing rules and sailing instructions at the discretion of the class representative, race committee or international jury. Copies of Sailing Instructions will be available from the Race Offices the day before the Regatta/s. 7.1. All competitors will compete in accordance to their class rules. (a) If a first penalty is signaled after she has finished, a boat will be given a scoring penalty of 8 points without a hearing. (c) Action by the jury under Appendix P shall not be grounds for a request for redress by a competitor. The jury however may initiate redress. This changes rule 60.1(b), 60.2(b) and Appendix P4. 9.2. Decisions of the jury will be final as provided in rule 70.5. To encourage boats to take penalties afloat, jury/protest committee members may blow a whistle when they see what they believe to be a breach of a rule. An international jury may be appointed in accordance with RRS Appendix N and perform the duties listed in RRS N2, in which case the decision of the Jury will be final. The individual regattas will be scored using the Low Point System according to RRS Appendix A. Competitors shall wear personal flotation devices at all times when afloat, except briefly when changing or adjusting clothing or personal equipment. Wet suits and dry suits are not personal flotation devices. This changes rule RRS 40. By entering the Championships competitors accept that they may be photographed and/or videotaped participating in the race and/or using the MMW facilities and they consent to the taking of such images and to the use, reuse, publication and republication of such images in any media, in conjunction with the competitors name or not, without compensation and without the competitors approval of such images or any use thereof. The Sailing Clubs, the National Authorities and each International Class Association, their officers, members and volunteers do not accept liability for loss of life or property, personal injury or damage caused by or arising out of the Mediterranean Masters Week and competitors take part in the regattas at their own risk. The establishment of the Notice of Race and the Sailing Instructions in no way limits or reduces the complete and unlimited responsibilities of a competitor being solely and entirely responsible for the management of a boat he or she is sailing. A competitor must be of good health and a competent sailor capable of sailing a Laser in strong winds. It is the responsibility of each sailor to decide to participate in a race or to continue racing. A competitor is wholly and exclusively responsible for third party liability insurance on the boat that he or she is sailing and for his or her personal accident and health insurance. Insurance requirements details for the regatta can be found in 4.2 of NR. The Notice of Race can be downloaded from here.